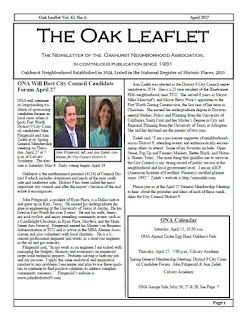 Check out this month's issue of The Oak Leaflet online! This month's newsletter highlights the upcoming ONA spring general membership meeting, including the candidate forum for Fort Worth City Council District 9 and nominating committee report for ONA officer elections. Also featured are recaps and photos from the recent Backyard Cookout and Porch Crawl, a reminder about this weekend's Easter Egg Hunt, and a form for the upcoming (13th Annual!) Neighborhood Garage Sale.